Gnejsgranit deliver Wedges & Shims to customers with in EU. Please contact info@gnejsgranit.se for details about shipment and costs. Feather and wedges also known as: Kile and Blekk, Kile & Blekk, Steinkiler, Kivikiila, Plug and feather, plugs and wedges, feather and wedges, wedges and shims, pins and feathers and feather and tare. Wedge & Shims is a three-piece tool-set that is used to split stone. The tool is made of steel and consists of two tapered shims that together with the wedge form a set with the same diameter at both ends. Holes are drilled in the stone using a drill bit with the same diameter as the wedge & shims set. A common 800 – 1500W hammer drill and a carbide rock drill bit is sufficient. Renting rock drill equipment will make drilling faster. The size and quality of the stone determines distance between the holes. 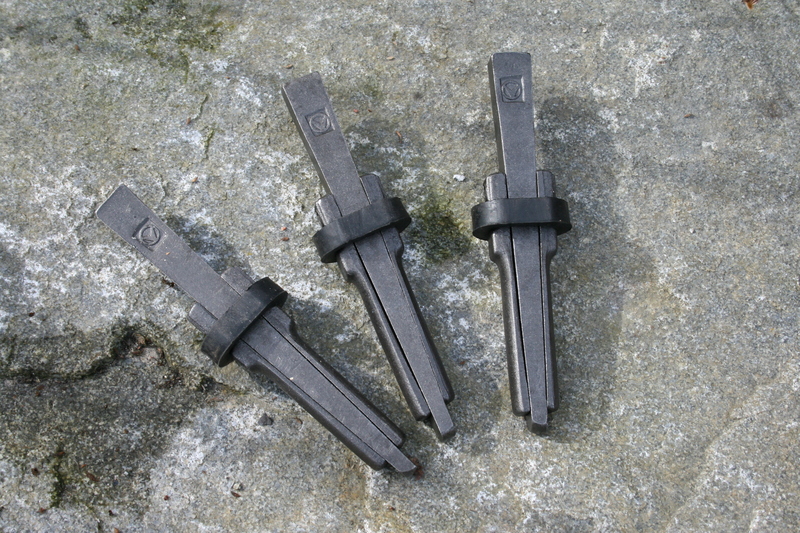 Approximately 10 – 20 cm apart for 20 mm wedge & shims. Depth of holes needs to be sufficient for the wedge to be struck down between the shims until the stone cracks. Insert wedge & shims to the holes and make sure that they are lined up so that they are perpendicular to the line of split. The wedges are then struck with a small stone maul in sequence. Eventually a crack will appear on the surface and the stone splits apart. Orders are normally shipped with in one day and latest three days. All Prices are in SEK and include VAT. Gnejsgranit´s return period is 30 days. Gnejsgranit shall, if under the jurisdiction of our return policy, refund you what you have paid for the product and/or service as soon as possible, but latest within 30 days of the product being returned or you informing us of wanting to return a service. You are obliged to pay for the return delivery of the product. When returning a product you are obliged to keep the product/service in the same condition as when delivered.